The 2015 TLX is a new kind of thrill from Acura. Earlier this month, Honda’s luxury division, Acura, confirmed that the 2015 Acura TLX will debut at the 2014 New York International Auto Show in New York City this April. The 2015 Acura TLX is promised to deliver new levels of luxury and athleticism and heralds in the performance we can expect from the next generation of Acura powertrains. In fact, two new powertrains are offered for the 2015 TLX. Drivers can choose between a 2.4-liter 16-valve direct-injected i-VTEC® four-cylinder engine and a 3.5-liter 24-valve direct-injected i-VTEC V6 engine. The four-cylinder is mated to a brand spankin’ new eight-speed dual-clutch transmission with torque converter while the V6 works with an also new nine-speed automatic gearbox. Two-wheel drive is offered for both powerplants and employs the latest Acura Precision All-Wheel Steer™ (P-AWS™) technology with independent left and right rear-wheel toe angle control. All-wheel drive, in the form of the TXL SH-AWD™, is exclusively available on the 3.5-liter engine, however, and utilizes the next-generation Super-Handling All Wheel Drive™ system. This system is reportedly 25 percent lighter than its predecessor and now uses new torque-vectoring control logic. The 2015 Acura TLX was designed with safety in mind. Available for the new model are Adaptive Cruise Control (ACC) with Low-Speed Follow, the Blind Spot Indicator (BSI), the Collision Mitigation Braking System™ (CMBS™), Forward Collision Warning (FCW), and Lane Departure Warning (LDW), among other safety features and driver-assistive technologies. 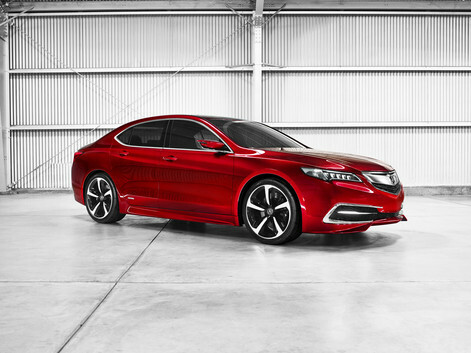 In addition, Acura is touting the all-new 2015 TLX as a car that delivers “vault-like quietness in all driving conditions.” Acura reports that improvements to body stiffness, body sealing, and sound insulation, in combination with electronic Active Noise Control, have allowed for the best noise reduction available. The 2015 Acura TLX will officially be revealed during the automaker’s press conference at 1:50pm EST on April 16, 2014, at the Jacob Javits Convention Center, so watch for more information in mid-April.